Christmas will be here in just 2 weeks! In our family, Christmas is huge, huge, huge. We have 3 days filled with family, love, fun, happiness, food and presents. The 23rd is at our home, the 24th at my in-laws and the 25th at my parents. It is pretty amazing for an adult, let alone how magical it must be for the kids. To us, Christmas is about family and love. Of course it is about the presents and the food too, but those would not matter if we did not have our family to share them with. We will be enjoying our family and appreciating the love and support we have year round from our loved ones. This year we will be giving back to our community by helping out a friend of ours who does not have the financial means to give their children a present-filled Christmas this year. Although Christmas is not just about the presents, I do believe every child should be able to experience the magic of Santa Claus. Over 16 million children in America live in families that are caught between poverty wages and a livable income – which means they don’t necessarily need public assistance; it just means they have a harder time during the holidays. Right now, Champions for Kids, is running a campaign; Disney Stocking Stuffer Celebration. They are encouraging anyone who is able to help to put together a Disney themed stocking for children in need this holiday season. We will be shopping at Walmart for all of our Disney items, as they have a large selection of Disney items and their prices are pretty much unbeatable. Make sure to come back next week to check out our shopping trip to put the stockings together, I am so excited! 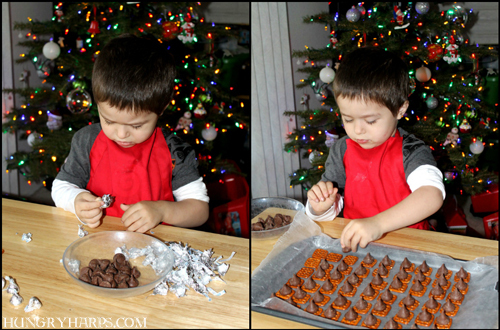 Your family's Christmas celebration sounds magical indeed--and what a cute little guy helping you in the kitchen. It's so much fun and warmth when families get together for the holidays. I can't wait for my family celebration. 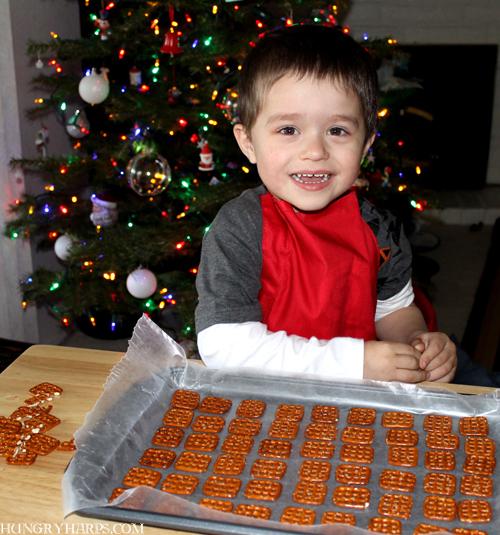 As for the Pretzel Kisses recipe, that's a keeper! What a CUTIE! 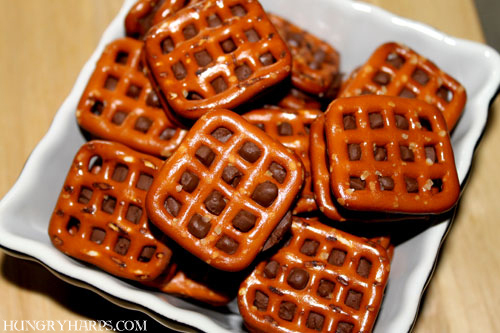 I think my husband would like these...and I have to do something with a whole bunch of pretzels I bought (Christmas shapes...I think the trees might work!). I'm always looking for something with the savory and sweet combined. Great post! What an adorable little helper you've got there!! Your family Christmas sounds wonderful. Your helper is a cutie.